Nuclear power: is small also beautiful? In a recent post I outlined some of the challenges facing Hinckley Point C – the flagship next generation nuclear project in the UK. Various commentators have suggested that new nuclear in the UK has missed the boat since the deployment of renewables combined with the problems with the new EPR technology means that there will be no nuclear renaissance in the UK. There are good reasons for agreeing with this assessment, particularly given the problems with Flamanville, but the question is whether this is true for all new nuclear projects, or just super-large ones such as Hinckley Point. Since the first commercial nuclear reactors were developed in the 1950s, they have become progressively larger in order to capture economies of scale. This has resulted in enormous multi-GW facilities with long and complex construction requirements and astronomical capital costs. The combination of high complexity and high cost drives economic risk and makes these plants difficult to finance, raising the need for subsidies and government guarantees. However, at the opposite end of the spectrum is a proven small-scale nuclear technology – work on nuclear marine propulsion began in the 1940s, with the first nuclear-powered submarine, USS Nautilus, being launched in 1955. In the UK, Rolls-Royce pressurised water reactor (PWR) technology has powered nuclear submarines since 1966. Nuclear power is also used for surface ship propulsion, for example in US aircraft carriers and Russian ice breakers. In recent months there has been a lot of excitement in the UK about the prospect of small-scale nuclear, and the government is keen to pursue the idea having funded a number of studies into the technology and has devoted £250 million in the latest budget to finance a competition to identify the best prospects. Small modular reactors (SMRs) are defined by the International Atomic Energy Authority as nuclear fission reactors with an output below 300 MW. They are manufactured in factories rather than being built on site, and are designed to be modular with larger plants being constructed from multiple modules. 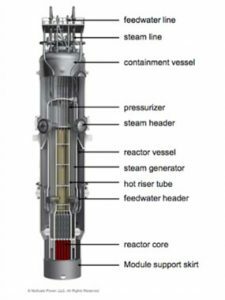 Most SMRs are being developed using one of four technologies: light water reactors (LWR), fast neutron reactors (FNRs), graphite-moderated high-temperature gas-cooled reactors and molten-salt reactors (MSRs). The main focus is on advancing LWR designs as they are seen to have the lowest technological risk, being similar to conventional nuclear plant. A small number of SMRs are currently in operation around the world: small reactors have run a remote site at Bilibino in Siberia since 1976, with the excess steam supplying a district heating system (graphite moderated boiling water), and there are also small reactors operating in China (PWR), Pakistan (PWR) and India (PHWR). China is currently building two 250 MW high-temperature gas- cooled reactors. The World Nuclear Association has a comprehensive outline of the state of SMRs worldwide and the technologies under development on its website.